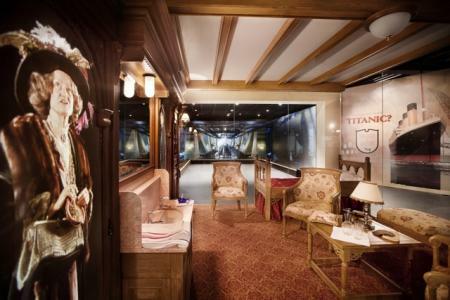 Titanic Belfast uses special effects, rides, reconstructions and interactive features to explore the Titanic story. 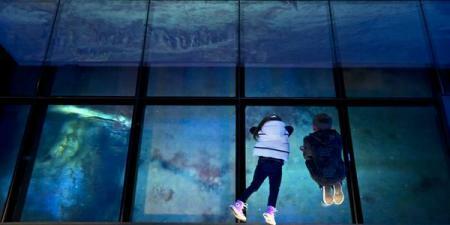 We find out what the world's largest Titanic visitor attraction has to offer children and families. Chris and Miranda Emmerson visited Titanic Belfast with daughters Alice, 5, and Rosalind, 3. They were accompanied by other members of the family, including Chris's mother Mary whose grandparents lived in Belfast and watched the Titanic launch in 1912. I have to admit I am a Titanicphobe. I find any obsession with major disasters ghoulish; I hated the James Cameron film; I really hated that Celine Dion song. But I loved Titanic Belfast. The whole experience has been curated with so much love, imagination and thought that one cannot fail to be moved and delighted. It is a sensory marvel from the moment you arrive, utilising architecture, period film, touch screen technology, dramatic reconstruction and rides to create an immersive experience which would bear repeated visits for young and old alike. The staff are extremely helpful and enthusiastic; one gets the feeling that this place is as much fun to work in as it is to visit. For those of you concerned about taking young children to something potentially upsetting, I would say that the museum focuses far more on the historical context, building and re-discovery of the Titanic than it does on the sinking. The sinking is dealt with in an impressionistic way so that older children can read the testimony and study the records but younger children can pass through those galleries without recourse to costly therapy afterwards. My youngest daughter, Rosalind, loved the flax mill constructed like a giant doll's house with scenes inside you can view at the touch of a button. She also adored the ride into the heart of the Titanic under construction. The museum is filled with touch screens providing further information about the ship and the city that made her and these interactive features, as always, proved irresistible to little fingers. Both Rosalind and Alice went wild for the rivets game which saw a room full of small children leaping around to try and stamp on hundreds of rivets before the time ran out. Alice really enjoyed the activity sheets available from the visitor centre. The sheets offer a spotting game for younger children and a quiz for older kids on the other side and both the children completed the easier game with great glee, searching for characters hidden in galleries throughout the museum. You can also download and print self-guided walks for KS1 children and KS2 children before you visit Titanic Belfast. Alice also loved playing the navigation game in the exploration zone at the end where she dove under the sea to discover other wrecks around the coastline. 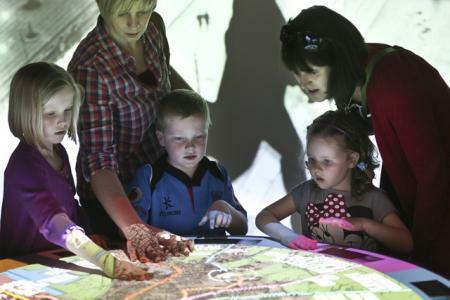 Older children would enjoy the immersive social history of period Belfast in the first sections, where whole rooms are filled with giant projections of street scenes from turn of the century Belfast. Kids keen on drawing and engineering will find lots to look at in the galleries given over to the design process and children interested in period design will be fascinated by the recreated cabins, astonishing in their detail and beauty. The section on the re-discovery of the Titanic also offers an amazing film of the wreck and the chance to be talked through the sunken ship as it seems to pass below you on screens you can stand on. Older Key Stage 2 children might also enjoy the audio guides (£3 rental on site, or download from iTunes for £1.50) which the adults in our party used around the museum and which offered a very accessible and relatively simple historical commentary. The swooping ride through the Titanic under construction, where you actually feel the heat of the furnaces and hear the spoken testimony of the men who built the ship. During school holidays the museum sometimes offers workshops and street entertainment in the main atrium. This is free and doesn't need to be booked in advance. At Christmas, they offer a hugely popular Santa experience which is paid for and needs to be booked well in advance. We ate in the bistro which offered a good range of salads, hot food and children's option. The food was excellent: fresh, healthy and delicious. There is also a canteen-style cafe offering sandwiches and cakes. The indoor picnic area is only for schools but there are benches outside which would serve for a picnic on a fine day. Titanic Belfast is part of the Titanic Quarter (where W5 kids' science centre is also located). It's a fifteen minute walk from Titanic Quarter Rail Station, or a ten-minute bus journey from Belfast city centre. Family tickets (2 Adults & 2 Children) start at £39, with under 5s free. A 5% discount is available if you prebook your tickets online in advance. Opening hours are vary according to season: January - March (10am - 5pm); April - May (9am - 6pm); June, July, August (9am - 7pm); September (9am - 6pm); October - December (10am - 5pm). Last admission is 1hr 40m before closing time. Titanic Belfast is closed December 24th, 25th, 26th. Alongside the extensive range of clothing there is a host of Titanic merchandise (no Christmas tree is complete without a commemorative Titanic bauble...). Pocket money options are few and far between but include ship magnets, period posters and Titanic rubber ducks. 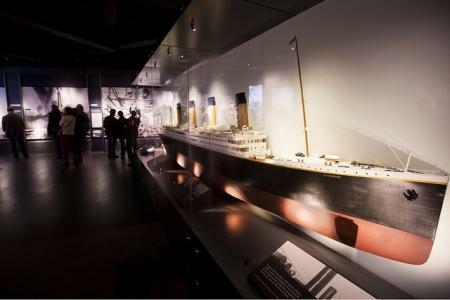 Brilliant resources about the Titanic for school projects can be found in the Titanic Stories area of the site, as well as a ship and maritime glossary. You can also download free activity and information sheets about ocean exploration, sea creatures, jellyfish crafts and more.